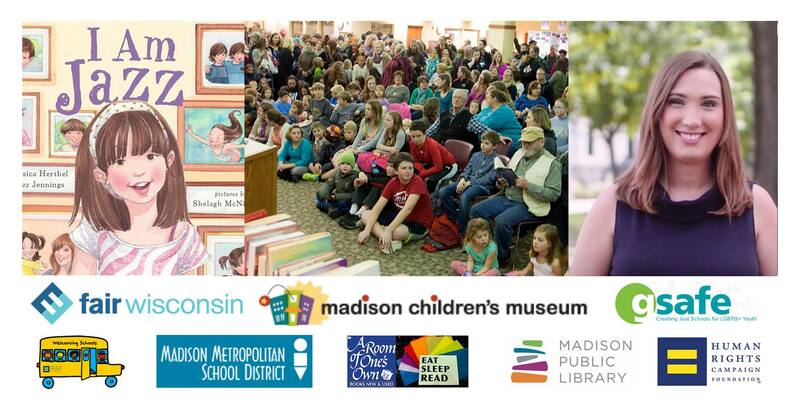 On Thursday, the Madison Children’s Museum will be hosting a reading of I Am Jazz, a children’s book by transgender teen and Human Rights Campaign (HRC) Foundation Youth Ambassador Jazz Jennings, to support transgender and non-binary youth. HRC National Press Secretary Sarah McBride, the first transgender person to address a major party convention, will speak and read I Am Jazz to assembled families. The free event is being presented as part of the HRC Foundation’s Welcoming Schools annual National I Am Jazz School and Community Readings on December 7, inspired by residents of Mt. Horeb, Wisc., who in 2015 stood up for a local transgender student and repudiated bigotry. The National Education Association (NEA) is co-sponsoring the effort, which will feature hundreds of readings across the country. This event is co-sponsored by MMSD, GSAFE, A Room of One’s Own, The Madison Public Library, Fair Wisconsin and the Madison Children’s Museum. Sponsoring organizations will have information tables, and A Room Of One’s Own will be selling gender-inclusive books. The national day of readings is inspired by the more than 600 residents of tiny Mount Horeb, Wisc., who in 2015 unequivocally supported a young transgender student and her family and rebuked bigotry and censorship by showing up for a public reading of the book. The reading was organized by a caring local parent after legal threats by an outside anti-LGBTQ hate group forced the transgender student’s school to cancel plans to support her by reading the book in class. The national effort is sponsored by HRC Foundation’s Welcoming Schools program and NEA. It unites in action youth, educators, and allies across the country who are hosting readings of I Am Jazz in hundreds of schools, churches, bookstores, homes, and community centers in states across the country. HRC Foundation’s Welcoming Schools describes itself as “the nation’s premier professional development program providing training to elementary school educators to welcome diverse families, create LGBTQ and gender inclusive schools, prevent bias-based bullying, and support transgender and gender expansive students.” HRC’s Welcoming Schools has created this guide to help organizers of I Am Jazz reading events build more affirming and supportive spaces for transgender and non-binary youth across the country.